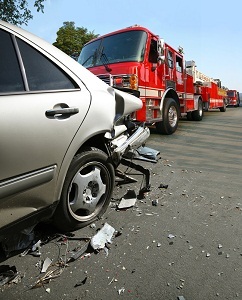 Motor vehicle crashes involving flatbed, semi-trucks or tractor trailers can lead to serious injury or death. According to statistics compiled by the Federal Motor Carrier Safety Administration, in 2015 4,311 large trucks and buses were involved in fatal crashes, an eight percent increase from 2014. The Federal Highway Administration reports that there were more than 260 million registered vehicles in the United States in 2014. More than eight million of these vehicles were single-unit or straight trucks, 2.5 million were tractor-trailers or semi-trucks and there were 800,000 buses on the road. That year registered vehicles traveled more than three trillion miles. Trucks were responsible for 279 billion of those miles or 9.2 percent of the total, and buses traveled 16 billion miles accounting for 0.5 percent of the total. Why are crashes involving trucks so dangerous? If you have a herniated disc injury, the results of your MRI will be crucial to the settlement value or trial value of your case. The insurance adjusters and lawyers will likely spend more time debating the significance of your MRI than any other part of your case. Why so much debate of radiological films we can all see? The reality is that you can look at two identical MRIs. One patient will be in extreme pain. The other will not even know that she has a herniated disc. This is the backdrop for the battle over the value of these claims. Our law firm has had a lot of success in these cases. Let’s talk about herniated disc injury cases and the significance of the MRI results to your claim. Can a Jury Award Zero in Noneconomic Damages? In Carr v. Cinnamon, a California appellate court applied the same rule we have here in Maryland: the finder of fact can award whatever they want for noneconomic damages, including zero even when it seems preposterous that a person could suffer medical bills and have no pain and suffering. Plaintiff’s premises liability lawsuit alleged that her leg fell through the floor of a patio on defendant’s property. The jury found the defendant partially responsible and awarded a whopping $6,207.08 with no damages for pain and suffering. Improbably, Plaintiff’s attorney appealed, arguing that the damages award was inadequate as a matter of law and the trial court should have awarded damages (additur) or awarded a new trial. The appellate court disagreed, finding juries can essentially do whatever they want. One thing is for sure: this jury was not a big fan of this plaintiff. The National Highway Traffic Safety Administration published a study this week, showing that three separate devices designed specifically to alert drivers when infants and children are left alone in a car do not work properly. Part of a campaign to raise awareness and prevent heatstroke, the study results say that these devices are unreliable when used on their own. According to the San Francisco State University Department of Geosciences, in 2012, 15 children and infants have died from hyperthermia from being left alone in a vehicle. Since 1998, almost 550 children have died, half of them under the age of two years old. These tragic deaths are unnecessary and several companies released products that are supposed to alert the driver if he or she walks away from the vehicle without extracting the child. Three of those devices were tested by researchers at the Children’s Hospital of Philadelphia. They tested the ChildMinder Smart Clip System, the ChildMinder Smart Pad, and the Suddenly Safe Pressure Pad. The main problem they discovered was that carseats with lots of padding made it hard for the sensor to work properly. Yes, that’s a big title. But the study looked at an incredibly simple issue: are neck injuries in car accident a harbinger of neck pain later in life after the injury has resolved. So the study looked at the association between a lifetime history of neck injury from a motor vehicle collision and the development of troublesome neck pain. The answer was what plaintiffs’ car accident lawyers were sure to tell you would be the case: patients with a history of neck injury in a traffic collision are more likely to experience future neck pain.